Guest Post: Will the Nexus 7 stand the test of time? Editor’s Note: This guest post comes from Ryan Weber, the co-founder and senior vice president of product management of the user acquisition and monetization company W3i. He received his B.S. in Computer Science from St. Cloud State University, and was honored with the University’s 2007 Alumni Award for the Graduate of the Last Decade. You can find out more about W3i here. Two thousand years from now, when historians are sifting through dusty iPads and old Inside Network postings, they’ll likely claim 2012 was the beginning of the tablet wars. With Microsoft entering the ring with the Surface and Apple gearing up to launch the iPad Mini soon, the tablet market is hotter than ever. Recently, Google also made a huge tablet play in launching the much-anticipated Nexus 7 to expand its tablet market share. Although there is a lot of buzz around Google’s latest tablet, it’s not likely the Nexus 7 will have a lasting substantial impact on mobile app developers. The Nexus 7 may be Android’s current best shot at putting forward a serious iPad competitor. However, the weakness of the Google Play market will make it unappealing to mobile developers in the long run. However, developers may still want to take advantage of the Nexus 7. With minimal additional development costs incremental revenue can be earned. Since its launch in June, the Nexus 7 has quickly gained a meaningful share of daily active users, relative to other Android tablets. 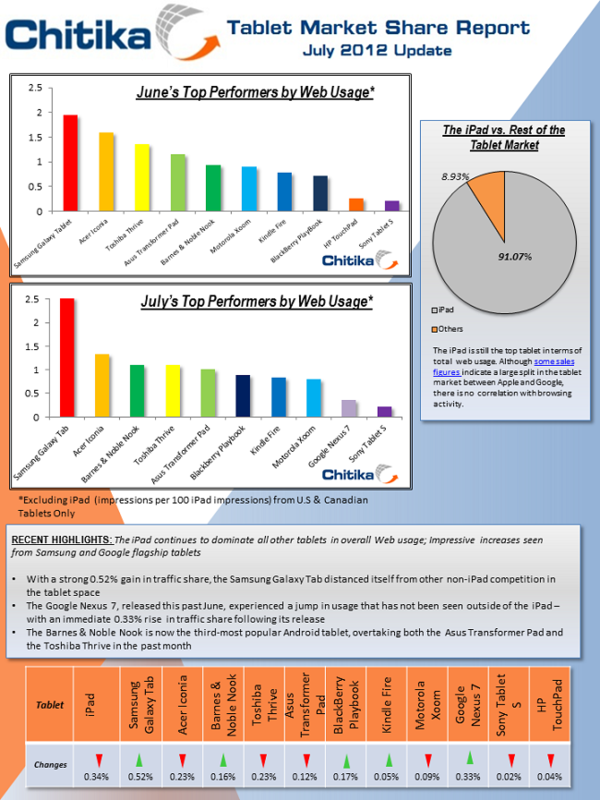 Analyst firms like Chitika are reporting the tablet saw a 33 percent rise in traffic share following its launch. This is the strongest release coming out of the gate that we’ve seen from a tablet since the launch of the iPad. Although it is the current poster child of the tablet space, it’s likely that the initial consumer interest in Nexus 7 will drop off. This is what happened to the Kindle Fire just four months after it launched. W3i shows a rapid market share increase in the first two weeks after launch from analytics from the W3i Monetization Platform for Android games. For the foreseeable future, it appears that Apple will continue to dominate the tablet space. In June, Changewave reported that seven percent of consumers surveyed plan on buying a tablet in the next 90 days, and of that group, 73 percent plan on buying an iPad, eight percent will buy an Amazon Kindle Fire and six percent will purchase a Samsung Galaxy Tab. Apple clearly has the lion’s share of the tablet market—a fact that mobile developers are all too aware of. If demand for the Nexus 7 does drop off, it could be due to a lack of a strong supporting app store. Although Google Play is showing competitive download volumes compared to Apple overall, this is due primarily to their growth in smartphone market share rather than their tablet growth. Google doesn’t have the legs to maintain the Nexus 7’s current popularity. It is worth noting that developers should monitor the continued progression of Google Play’s rapidly increasing in-app purchase (IAP) sales, which historically have been well below Apple and Amazon in performance. CCS Insight and Distimo reported that in January 2012 the top 200 highest-grossing apps generated daily revenue of $3.34 million from the iPhone and $2 million from the iPad App Stores. In comparison, Google Play saw a 31 percent rise in daily revenue, to $679,000 across smartphones and tablets for the top 200 highest grossing apps. This was driven by in-app purchases accounting for more than 60 percent of revenue across the iPad, iPhone and Google stores in the same period. In February, IAP increased to 73 percent for the top 200 highest-grossing Android and iPad apps and 79 percent for the top 200 grossing iPhone apps.